I decided to report on a few things of interest from this summer. The first picture attached is from a plant of Tainung 65. The yield from this plant was not impressive -- about half what I got from most of the Tainung 65 plants in the same row -- but the colour is interesting. From what I assume is a colour mutation, the usually red skinned Tainung 65 has produced a candy-striped effect. 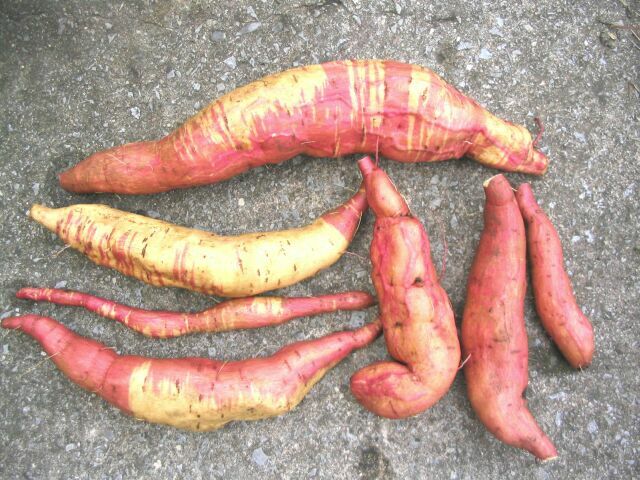 A few years ago, I had a plant of Owairaka Red (Kumara) which produced a bicolour (red and white) fleshy root. Slips from the white part produced white roots the following year. I found this interesting but, since I find the red roots much more attractive, not of practical use. 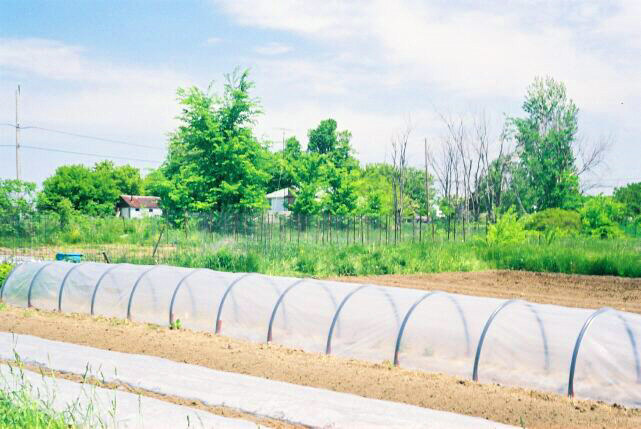 When I was collecting anecdotes for my sweet potato book, I discovered that the gardeners who got the best yields used some form of coldframe over the bed for the first month (in addition to mulching with clear plastic for soil warming) to give their plants a head start. Frames for erecting over a 3' wide, 40' long bed are either too expensive or too cumbersome, so I have not bothered with them in my garden. 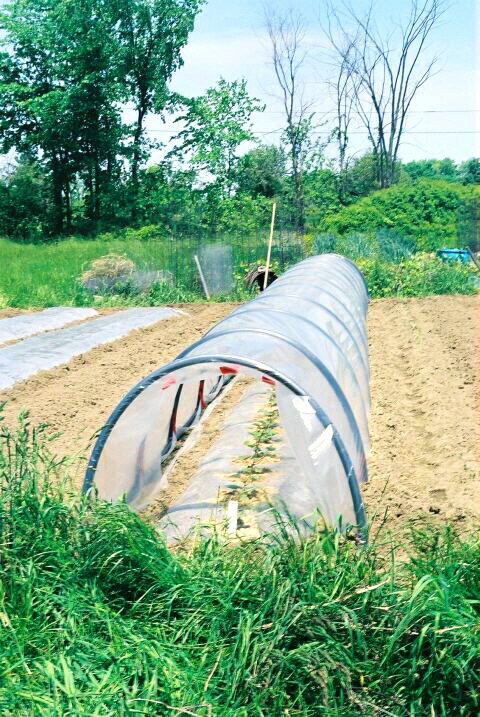 Last winter, I figured out a way (using black plastic drainage pipe) to make a 40' hoophouse coldframe for about $100 (Canadian). The second picture shows the frame before being covered with clear polyethylene. 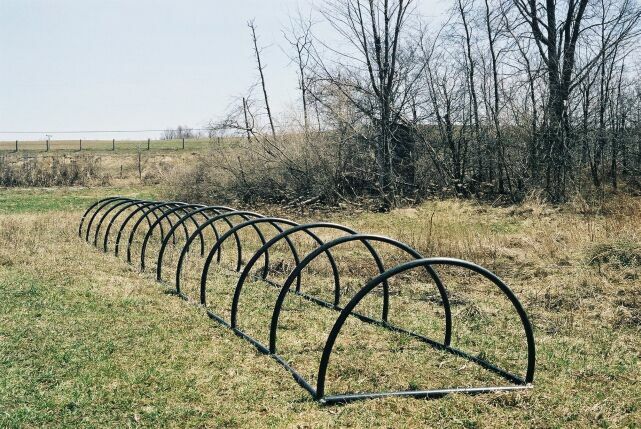 The runners between hoops are rigid black plastic 1 1/4" pipe and the hoops are from the cheaper black plastic pipe that comes in large rolls and is just flexible enough to bend for the hoop. The runners and hoops are joined together with tee connecters. Plastic was stretched over the hoops and wrapped around the runners and held on by tape (the ends were left open -- they could be covered with a blanket in case of frost). I tried using wrapping tape first but it doesn't stick when it gets hot. Red Sheathing Tape is definitely stronger and stickier and worked well. I got a few friends to help move the frame into place over the row (very wobbly) and then piled soil on the outside edges to keep the frame from taking flight (the shape resembles an airfoil and it did do some flying soon after it was covered and waiting, unsecured, to go over the bed). The third picture was taken a week after the frame was removed and the rest of the beds were planted. Third over is the row that got a head start (about three weeks) under the coldframe. Yield of 5 lb/plant (15" spacing in the row), for Canadian Georgia Jet, was 10% better than my next best row. Not as impressive as hoped. 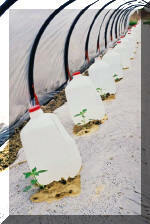 I intended to get the coldframe row in even earlier than 3 weeks but the slips were not ready. Next year I will plan better and try again. One curious feature was that the two rows on either side of the coldframe row were the lowest yielding rows (about 3 1/2 lb/plant). I think what is happening is that the vines are territorial and vines of the coldframe row claimed the territory between the rows, suppressing the growth of adjacent rows. 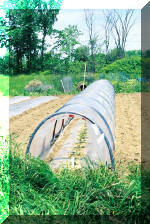 I designed this hoophouse coldframe with sweet potatoes in mind but immediately began to wonder about other vegetables. So I made two 40' frames. 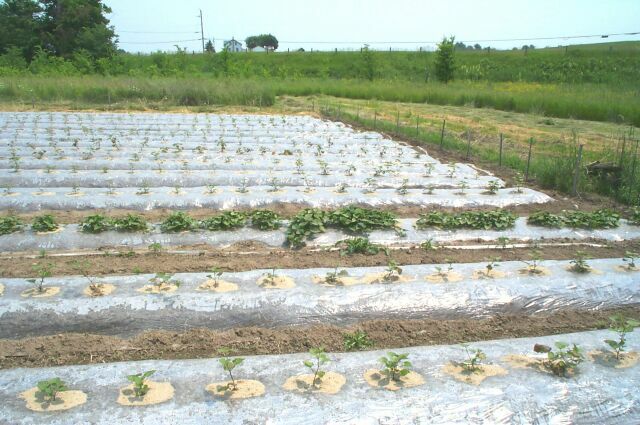 At the beginning of May, two weeks before installing the sweet potato frame, I planted a row of tomatoes, peppers and basil (in a clear-plastic-mulched bed) and set a frame over the row. I placed a gallon jug of water next to each plant to moderate the temperature (I have no idea whether the jugs did anything). I left the end of the frame open to avoid over heating (it gets pretty hot in there when the sun shines). The plant at each end was stunted -- it was a cool May. But none of the other plants showed signs of discomfort, either from heat or cold. The tomatoes, all indeterminates, grew a foot taller than the control row, were twice as productive, and started to ripen 10 days earlier. Peppers were early and productive. The Genovese basil (for pesto), however, was a disappointment. The biggest and best leaves are always produced before the plant flowers. The early start seemed to make the plants in a hurry to flower. They produced a few big leaves before the controls but not as many and not as big.